LACEY TOWNSHIP, N.J. (AP) — A nuclear power plant long considered to be the oldest in America shut down Monday, the victim of its age and inability to compete with newer, cheaper gas-fired power plants. The Oyster Creek Nuclear Generating Station in New Jersey went offline at noon Monday, powering down without incident for the final time after nearly a half-century of operation. The aging plant was seen as a victim of its age and the changing economics of power generation, where right now it is cheaper in many places to generate power by burning cheap natural gas rather than running nuclear power. Oyster Creek and the Nine Mile Point Nuclear Generating Station near Oswego, New York both went into operation in December 1969. The U.S. Nuclear Regulatory Commission had long listed both facilities as going online Dec. 1, 1969 — a date the agency acknowledged on Monday is incorrect. Nine Mile Point says it went into commercial operation on Dec. 14, 1969; Oyster Creek says it did so on Dec. 23, 1969. But Oyster Creek’s license was granted on April 10, 1969, the company said, about four months before one was given to Nine Mile Point, according to a 1970 document from the U.S. Atomic Energy Commission, a precursor agency to the NRC. Both plants, which are now owned by Exelon, say they have for decades considered Oyster Creek to be the older of the two, an assessment widely shared in the nuclear industry. There are now 98 remaining nuclear power plants in the U.S., said NRC spokesman Neil Sheehan. 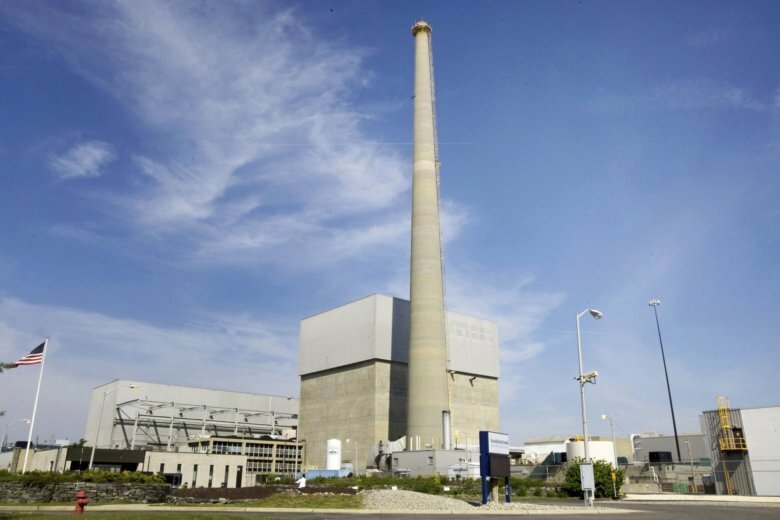 The plant in Lacey Township near the Jersey shore has dealt with corrosion and leaks during its time in service, but its owner, Chicago-based Exelon Corp., says the plant has always been safe. In 2010, Exelon reached an agreement with the administration of former New Jersey Gov. Chris Christie, a Republican, under which the plant would shut down within 10 years in return for not being required to build costly cooling towers to meet upgraded environmental standards. New Jersey officials are already planning on replacing some of the lost generating capacity from Oyster Creek with offshore wind energy projects. The state Board of Public Utilities agreed Monday to seek applications from companies interested in building such projects off the New Jersey coast. The initial round of projects would total 1,100 megawatts, nearly twice the amount generated by Oyster Creek, which powered about 600,000 homes. Democratic Gov. Phil Murphy wants to have at least 3,500 megawatts of wind energy off the state’s coast by 2030. Despite the fact that nuclear power emits virtually no planet-warming greenhouse gases, many environmentalists had long sought the shutdown of Oyster Creek over the years, citing corrosion that dangerously thinned its reactor vessel, and the leak of radioactive tritium into groundwater on the plant site. But the plant also has been the mainstay of the local economy in Lacey Township, a small town in the Pinelands near Barnegat Bay where fishing and recreation draw residents. The power plant is by far the town’s largest employer and source of property taxes; the township’s coat of arms has a nuclear isotope in it. Nick Juliano, the town’s Republican mayor, is concerned about the impact of the plant’s shutdown on the local economy and property tax base. But he is heartened that 300 of the 400 workers currently employed at the plant will remain there as fuel rods are removed and placed into secure storage. Jupiter, Florida-based Holtec International plans to buy Oyster Creek next year and speed up the decommissioning of the plant if necessary approvals are granted.